The Mother's Choice quilt block is a little more challenging to make due to the number of patches in the block. 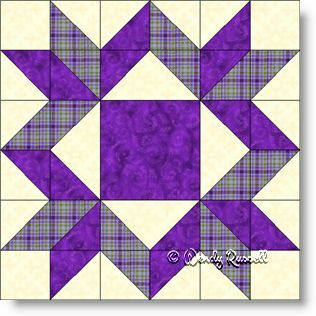 However, none of the units are difficult -- only squares, half square triangles and flying geese -- so with careful attention to your seam allowance, this block is a wonderful addition to your quilt. This quilt block reminded me a lot of Carpenter's Wheel which is usually created using diamonds. This is an easier block to make since it uses flying geese and half square triangle units rather than diamond pieces. This allows for less error on the part of the quilter. The two sample quilts illustrate setting the quilt blocks side-by-side or on point. Additional fabrics have been added to the 'on point' setting to break up all of that purple shown. However, you can be very creative with your colour choices -- and this quilt block looks fabulous made as a scrappy version.